It’s a question the news media and the left keeps asking, along with a number of Americans who decided back in ’08, along with that magnificent mental midget John McCain, that we had nothing to fear from an Obama Presidency. And the American people are starting to wake up to the threat Obama represents. The fact was and remains we had a great deal to fear from Obama, and his ideology, and Benghazi is merely one consequence of that ideology. Obama has been projecting the idea that his policies have been working… THat all cultures are “equal” and that if we only stopped being so “hostile’ to certain elements around the world they’d follow suit, they’d all be peaceful, and we’d all live happier singing Kumbayah around teh campfire ever after. Ambassador Chris Stevens died, in the service of that myth. A State Department document, obtained by the House Oversight and Government Reform Committee, chaired by Darrell Issa (R-CA), revealed that the U.S. mission in Libya recorded 230 “security incidents” over a one-year period between 2011 and 2012, including other high-profile attacks, like the attempted assassination of the British ambassador in June, gunfights, the murder of foreign nationals, and an explosives attack on the Benghazi consulate that occurred on June 6, 2012, according to Catherine Herridge’s FOXNews article yesterday. 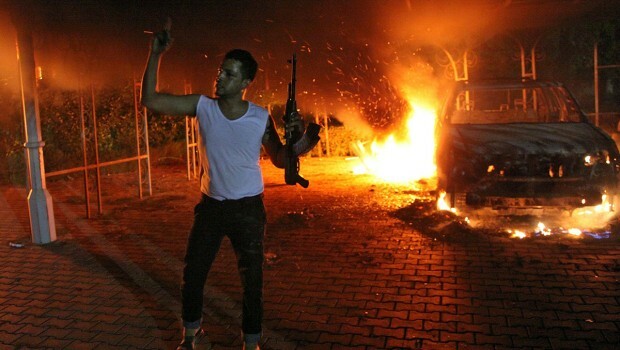 Even more damning to Barack Obama and Hillary Clinton, will be direct testimony taken during Issa’s high profile committee hearing on the attacks today, which will feature security officers who actually served in Libya over the past year. These incidents paint a clear picture that the environment in Libya was fragile at best and could degrade quickly; [and] certainly not an environment where [the] post should be directed to ‘normalize’ operations and reduce security resources in accordance with an artificial time table. Lt. Col. Andy Wood, the former head of a Special Forces security team, whose account is similar to Nordstrom’s, has also agreed to testify about being rebuffed by the State Department when calling for more security. I’m not going to go into all of these kinds of timeline details as to what we had when and where. Whether she realizes it or not, the writing is on the wall-she was pathologically ‘prepped’ and staked out to be the next ‘sacrificial lamb’ for the Obama Administration-much like the way that Islamic Jihadists’ persuade ignorant young men [and now women] to become ‘suicide bombers. Finally, it is extremely telling that Barack Obama would short change a room full of giddy college students, by coming off the campaign trail to meet an insistent Hillary Clinton this afternoon in The White House, for what is being billed a ‘damage control’ meeting. There’s only one reason for all this; The Obami are desperate to prevent the Amiercan people from finding out that Benghazi is now an Al Quieda strong hold… a fact which runs directly afoul of the mantra, “Bin Laden’s dead, Big Bird is alive”. Jim Quinn the other day mentioned that it might actually be a little too late for all of this to come out to affect the election. I like, Jim having been acquainted with him loosely from his days in the Buffalo radio Market. But frankly, I don’t think he’s spot on, here. The American people have been watching this business unfold for the last four years along with all the rest of it …. the war on America’s energy supplies, the war on health care, the war on individualism, and the government takeover of anything and everything. The pattern of course is well-established… this is exactly the same international leaning of every leftist president since Woodrow Wilson… they’ve all been driven by the same misbegotten ideas and ideals and and history is not kindly disposed to their records, once they make it out of the realm of the leftist worship centers that our government-run education system has become. It’s to the point where even staunch Democrats have started to question Obama and his ideology to the point of moving away from supporting him. The debates have shown this… particularly the most recent “Town Hall” where we had a number of supposedly “undecided” voters, who all seemed to tilt left in their questions of the candidates. There’s only one logical answer for what we saw that night…. There’s only one way, really to account for the ‘undecided’ voters offered up by Crowley at the most recent debate… All these undecideds, were actually former Obama voters who cannot stomach the idea of supporting the re-election of what they’ve seen the last four years, even though they’ve yet to determine in their own minds precisely what went wrong. They recognize Obama is a failure of epic proportions…. Even by the standards of the left. Trouble is, they haven’t figured out yet that the problem is leftist/socialist policy and that Obama is merely rather grotesque symptom of the problem, not the cause. That point aside, the trend is clear… the American voter has long since begun to see the threat that Obama represents. The fact is that while Benghazi may very well take awhile to steam roll to the point of removing Obama from the White House, if that was the only sin of the Obami that was on the minds of the American public… when added to the rest of the last four years, it is more than enough to push this election out of Obama’s reach. One can only wonder how long it will take to undo most of the damage the left has caused us. Of course, there are some damages, such as our people who have died because we projected weakness, that cannot be repaired.